If you’d like to make your money work for you, you probably have a few financial goals for the new year. I work with people every day who are working to do things like save for retirement, plan for college, and pay off their student loans. Accomplishing these financial goals is an important part of creating a secure financial future. But if you’re not sure where to start or if you’ve tried and failed before, what can you do differently this year? Instead of trying the same thing over and over, apply these principles from the latest psychological research to make sure you start the year in a better place. The first step to making financial progress is to pick a specific and achievable goal. You can start with a general idea like “pay off your student loans” or “save for retirement,” but you’ll need to take it a step further to turn the idea into action. Take a look at your actual numbers to see where you are. How many student loans do you have? What are their balances and interest rates? When you look at your budget, how much extra money do you have every month to put towards paying them down? Make sure your goal is reasonable. If you need to put 90% of your income towards your student loans to pay them off this year, it’s an unrealistic goal and you’ll need to adjust your expectations. It’s better to know now than to get discouraged and quit later. Once you have your goal, there’s a lot more to do make sure you actually follow through on your goal. One way to make sure you follow through is to automate your goals. Instead of relying on your momentary willpower to make sure you follow through, use your burst of enthusiasm to automate your savings goal. You’ll keep saving even when your motivation fades. If you’d like to save more for retirement, bump up your 401(k) contributions by 1%. Then put a note on your calendar to bump up your contributions by 1% every month for the next year. You’ll barely miss the money from your bank account, and by the end of the year, you’ll be saving 12% of your salary. Sometimes, it’s not enough to automate your financial goals. If you’re saving $200 every month, but you raid your savings every month, you’ll need to do more than just automate your goal. Instead, you can work on changing your spending habits so you can begin to spend less and save more. It’s a better long-term strategy to change your habits rather than relying on your willpower to make yourself behave differently. Habits happen automatically without effort, and you only have so much willpower. There are three elements of a habit: a reminder, a routine, and a reward. The easiest way to change a habit is to replace a routine with a different one rather than trying to create a new habit altogether. Let’s say you regularly eat out at lunch with co-workers, but you’d like to start bringing your lunch to save money. You’re reminded that it’s time to eat when your stomach growls. Your routine is that you go grab something to eat from the place across the street. You might think that your reward for this habit is the food. But often, a reward for a habit is less obvious. If you packed your lunch, you’d still have food to eat. But even when you pack your lunch, you want to go out. Instead, your real reward might be a break from the office or a chance to socialize with co-workers. Try various new routines to determine what your real reward for a particular habit is. By understanding what you really get out of a particular habit, you’ll be able to identify a way to get the same reward with a different routine. While it might be easier to replace a habit, you can create new habits. The key is to choose something very small. Psychology researcher BJ Fogg always gives the example of flossing your teeth. If you’d like to floss your teeth on a regular basis, just tell yourself you only have to floss one tooth. Some days you’ll feel so tired you’ll only floss one, but on many days, you’ll floss the rest. When the action is small, it takes a small amount of motivation to accomplish the goal. This makes actually doing your new behavior much easier, and you’ll be more likely to stick with it. Eventually, it won’t feel so hard to do a little more and you can do more. Say you’re working on your lunch habit. If cooking your lunch seems like too much effort, then start by bringing microwavable meals. You can get more complicated in time. However, choosing a small action isn’t enough. You’ll still need a reminder to actually kick-start your new habit. The easiest trigger to choose is something you do every day like waking up, brushing your teeth, taking a shower, eating dinner, and so on. Then tack on a small action to that. Adding a new habit onto an existing one increases your chance of success. If you focus on making your financial goals more specific and achievable, automate your savings or debt payoff, understand your motivation for your current habits, and create new habits by starting small, you’ll be able to accomplish much more than if you rely on willpower alone. 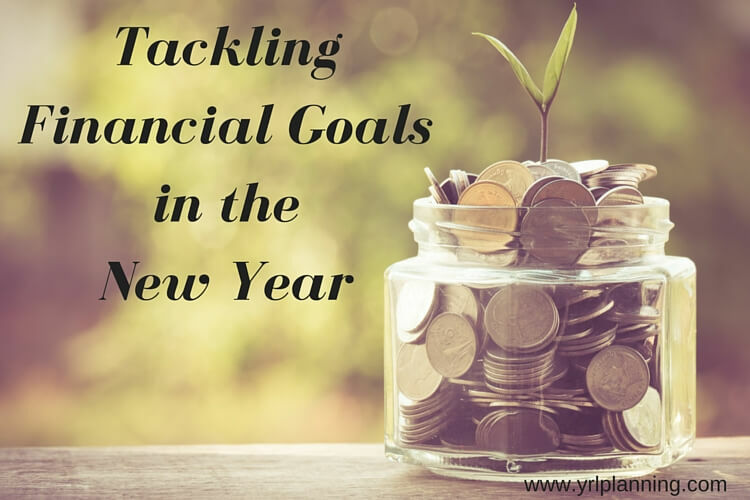 Make this year one of small, specific actions that build into achieving your financial goals.